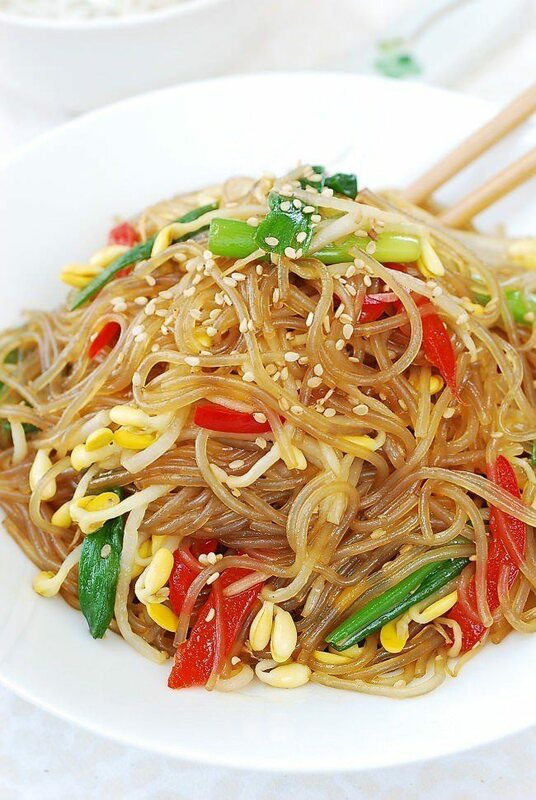 I really think you will love this simple variation of japchae made with soybean sprouts (kongnamul, 콩나물)! 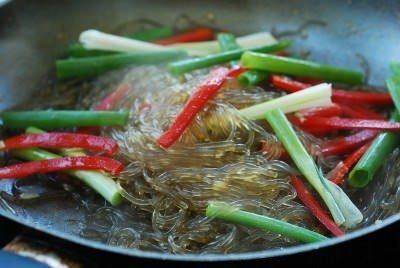 Japchae (잡채) is a Korean dish made with sweet potato starch noodles called dangmyeon (당면). The traditional dish includes thin strips of beef and various vegetables, but there are many variations! 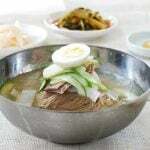 Depending on the main ingredient accompanying the noodles, the variations are called buchu (garlic chives) japchae, beoseot (mushroom) japchae, gochu (chili peppers) japchae, ueong (burdock root) japchae, kongnamul (soybean sprouts) japchae, etc. 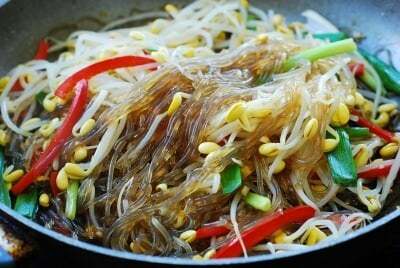 All you need for kongnamul japchae is soybean sprouts and sweet potato starch noodles, along with a few basic seasoning ingredients. Everything else is optional! I added scallions and a little bit of red bell pepper slices for color. 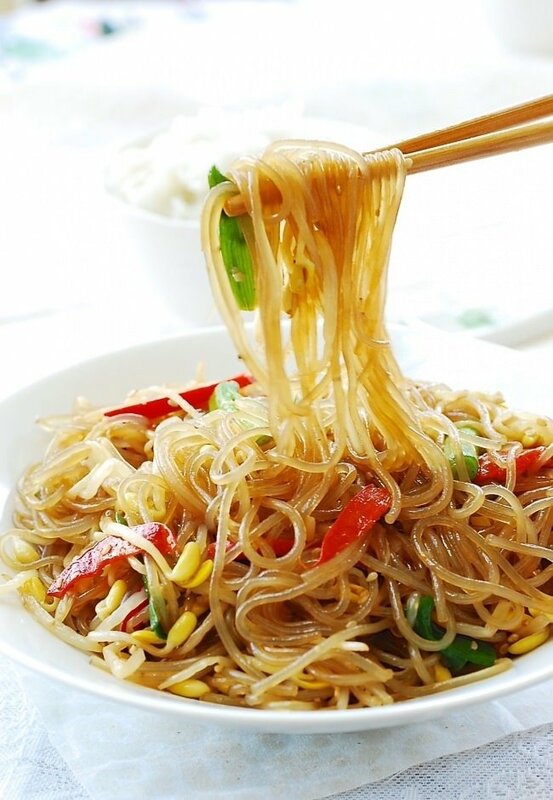 The ratio between the soybean sprouts and the noodles can be flexible. 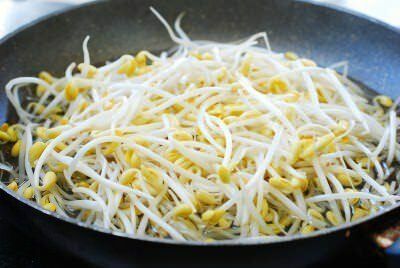 To make the dish, I cook the soybean sprouts first, remove the bean sprouts and then use the sprout flavored cooking liquid with a little bit of the sauce to cook the noodles. 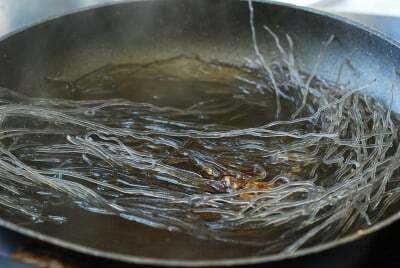 By the time the noodles are cooked, all the liquid will have been absorbed by the noodles. The result is springy noodles that are shiny and flavorful! 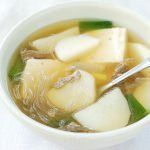 For the traditional japchae, Korean cooks typically rinse the noodles in cold water after cooking to stop them from turning soft, but the cooking method in this recipe keeps the noodles springy and shiny without that step. The rest is easy! 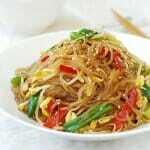 Quickly stir fry the noodles with any vegetables you’re adding, the soybean sprouts, and the remaining sauce. One tip about cooking soybean sprouts — you can cook them either covered or uncovered, but if cooking covered, do not open the lid until the sprouts are cooked, or the raw bean smell will linger even after cooked. 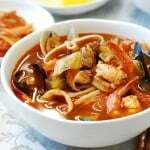 This dish can also be made spicy. 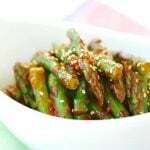 Add a teaspoon or two of gochugaru (Korean red chili pepper flakes) to the sauce if you want to add a spicy kick. 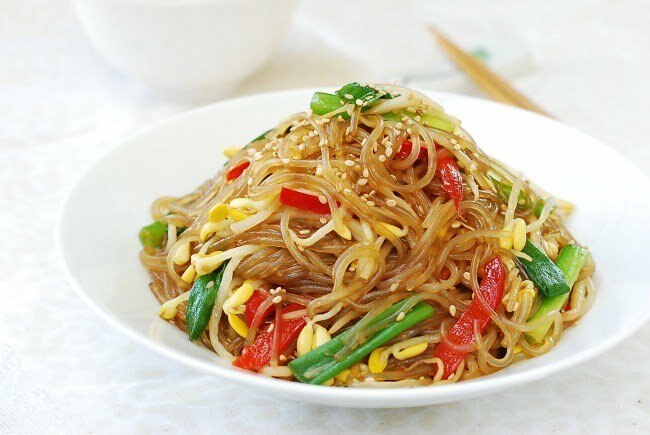 A quick and easy japchae made with soybean sprouts! Boil 2 cups of water in a pan over medium high heat. Add the soybean sprouts and cook for 2 minutes. Flip the sprouts over once, if cooking uncovered, for even cooking. Do not open until done if cooking covered. Mix all the sauce ingredients in a small bowl until the sugar is dissolved. Remove the soybean sprouts to a bowl, reserving the cooking liquid in the pan. 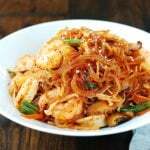 Add 1 teaspoon of cooking oil, 1-1/2 tablespoons of the prepared sauce, and the noodles to the pan. 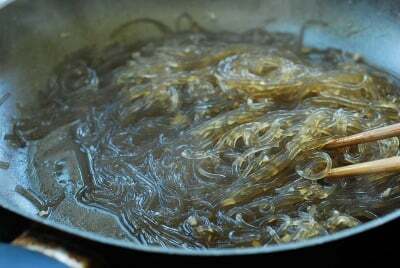 Cook the noodles for 6 to 7 minutes until the liquid is almost gone. When the noodles turn soft, cut with kitchen shears into shorter lengths. Add the scallions and red pepper slices, and stir fry briefly until the vegetables are slightly wilted. Add the soybean sprouts and the remaining sauce. Quickly toss everything until well combined before turning off the heat. I found your blog through the Try Guys at Buzzfeed and love your recipes! I made this one tonight and it came out terrific (although I did add a good amount of gochujang to mine). Next I want to try making oi sobagi. 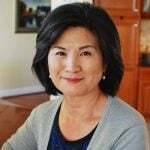 Thank you for your wonderful blog, “Try Mom”! Ha ha Try Guys — that was so much fun! Glad to hear this turned out well for you. Hope your oi sobagi turns out well for you. Thanks so much for this Miss Hyosun! 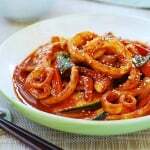 I have loved Korean food since I began working with them. Your recipes are just wonderful! My pleasure! Thank you so much for the note!